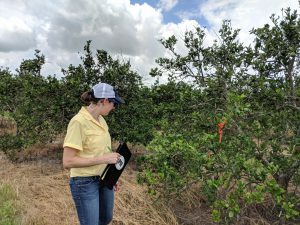 During the summer of 2018, I had the opportunity to intern with Arborjet, a plant health care company that specializes in tree injection systems and tree pest management. The internship offered me a great chance to put my DPM skills to the test. I did bioassays on arthropod pests, plant pathogens, and soil organisms. I was given the freedom to design experiments, conduct my own data analyses, and make recommendations from those results. I was able to practice pathogen isolation and identification, and I got to work with some insects we don’t get in Florida, such as Japanese beetles (Popillia japonica). This internship also provided good exposure to how pest management research is driven in the private sector. Sales are what provides the funding to develop new products, so there is a lot of collaboration with marketing to make sure that whatever is being developed is something that consumers will want to buy. I got to see the development process for new pesticide formulations and learned a little about how regulations affect product labeling. Though there are many large pest management companies with great internship programs, I am very grateful that my internship was with a smaller company as I was exposed to all aspects of the product life cycle and I was able to meet and learn from people acting in a variety of roles.